He was going to show us something new — but in art as in life, he was going to do it on his terms. Some around him would turn on, tune in, and drop out. Others would look and tell stories, but remain bystanders. None of this was for Thompson: from the front lines of the Counterculture through to the murky world of Nixon-era politics and beyond, he was to place himself at the centre of the action — no matter what the personal cost. The father of “gonzo” journalism — a reporting style that involves the author as protagonist via first-person narrative — Thompson walked among the Hell’s Angels for a year, living a drug, alcohol, and violence-fuelled existence. He reported on a new American tribe in its true colours. This style reached its LSD and booze-fuelled apex in Fear and Loathing in Las Vegas, one of Thompson’s most famed works. Ostensibly a road trip journal, Thompson takes himself to the brink and drags us along a dark, compelling ride into vice. Where there was decadence and depravity to uncover, Thompson was ready to shine a light on it. 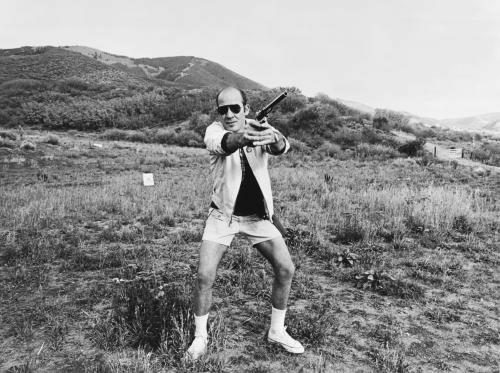 Scathing, funny, and wild: Hunter S. Thompson is the ultimate outlaw journalist.